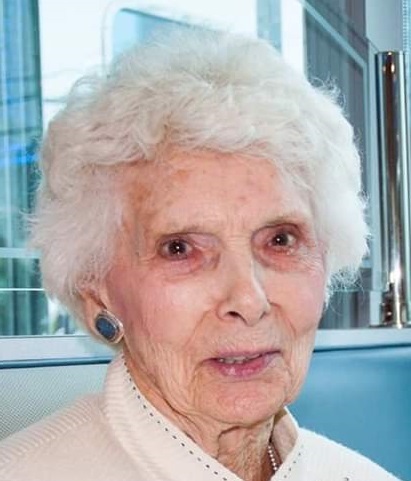 Mrs. Audrey E. (Brock) Glass, 94, of Blandon, PA, formerly of Front Royal, VA passed away on Tuesday evening, April 2, 2019 at Reading Hospital, West Reading, PA.
Born February 16, 1925 in Brooklyn, NY, she was the daughter of the late Addison W. and Elizabeth (Nolte) Brock. Her husband of 73 years, Charles E. Glass, whom she married on September 5, 1943, passed away on January 9, 2016. Audrey graduated from Valley Stream High School, NY, in 1943. She went on to attend real estate school and also took writing classes at Pennsylvania State University. Audrey spent many years caring for and raising her three daughters. In addition to being a homemaker, she worked as a real estate broker and was an author of children’s books. Audrey loved gardening, reading, sailing, snow skiing and hosting bridge parties. She was an excellent cook, a wonderful seamstress and most of all, a loving mother, grandmother and great-grandmother. Audrey is survived by her three daughters, Cheryl E. (Glass) Ford, Fleetwood, PA, Carol A. (Glass) Henry, Bonlee, NC and Arleen A. (Glass) Chapman, Atlantic City, NJ. She is also survived by her grandchildren, Jenni, Lori and Michael and her great-grandchildren, Justin, Caitlin, Alyssa, Patrick and Mason. Along with her parents, Audrey was preceded in death by her sister, Adele Gronert and her brother, Addison Brock. Services for Audrey will be private. In lieu of flowers, Audrey’s family asks that you make a donation to your local Animal Rescue League. Walbert Funeral Home & Cremation Services, PC, Fleetwood, is honored to be caring for Audrey and her family. Online condolences may be offered at WalbertFuneralHome.com.